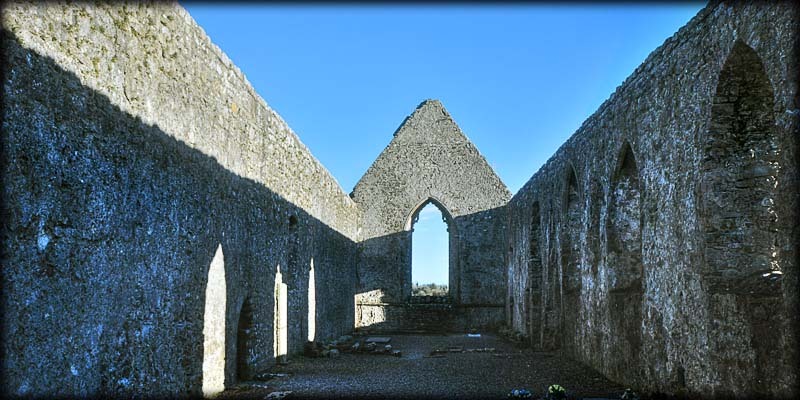 It is hard to say when the first monastery was founded at Drumlane. 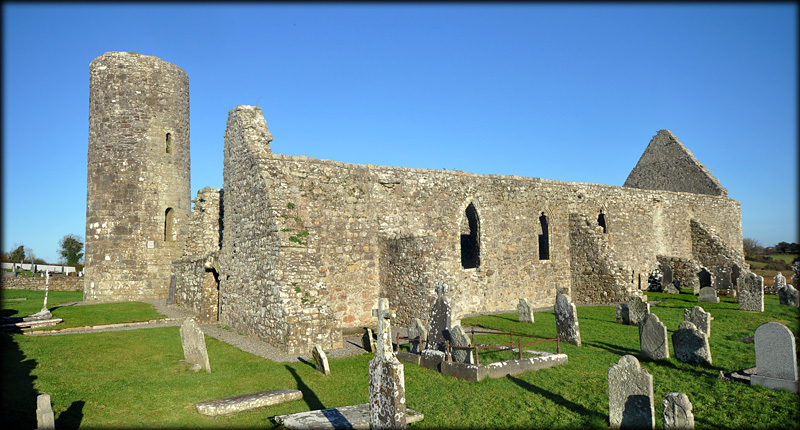 We do know that in the late 6th century St Maedoc, AKA St Aidan the first Bishop of Ferns, had a close association with the site, but it has been suggested the founder may have been St Colmcille in the earlier part of that century. What remains are a 13th century church, a round tower, the fragment of a cross slab, a graveyard and in the field opposite, the foundation of the early Abbey. 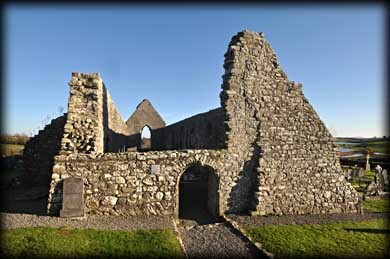 St Mary's Priory was established here on the northern banks of Garfiney Lough in the 12th century for Augustinian Canons. 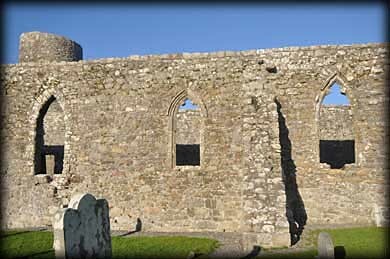 The church, which is at least 33 metres in length, was originally situated in the centre of the old graveyard but was extended west in the 15th century. It had a traciered window in the east wall and three more in the south wall. 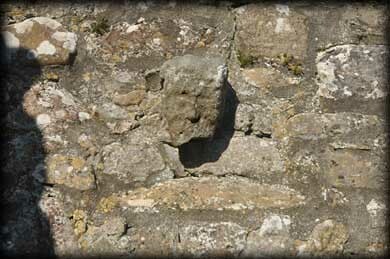 There is a mask next to the doorway in the south wall and three more can be seen on the exterior of the east window. Above the late medieval doorway in the west wall there is a carving of a Bishop's head on the keystone. 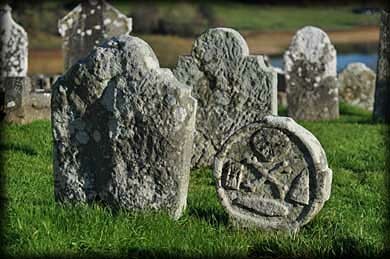 If you have time to wander around the graveyard you will find some very interesting gravestones. Drumlane is a very nice site in a superb location. 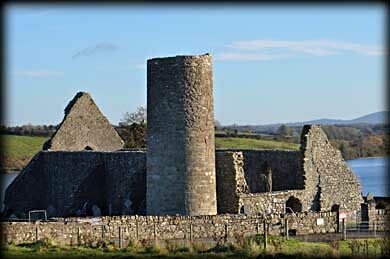 Situated: From Cavan head north on the N3. After 11 kilometres turn left for Ashgrove. 1.8 metre right after stone bridge. 3.5 K turn left. 350 metres turn left. Then it's 800 metres to the monastic site. Discovery Map 27: H 3413 1225. Last visit Nov 2013.